Do we still need virtual memory? Due to the rapid development of hardware, RMAs becomes larger and cheaper. It seems like that there’s no room for virtual memory anymore. Is this true? In the past few years, the rapid development of computer hardware led to a great cost reduction of RAM on the market. In the meantime, due to the popularity of Windows 7, more and more people nowadays choose to use 64-bit OS instead of 32-bit OS. All these facts have made contributions in generalizing the large capacity RAMs. Here comes a question: do we still need virtual memory considering that the RAMs now are generally no less than 4GB. What is Virtual Memory and How Does Virtual Memory Work? What is virtual memory and how does virtual memory work? Virtual memory allows us to use a portion of our hard drive as though it were RAM and combine this part and the real RAM together. When the RAM runs low, virtual memory will move the data out of the RAM then transfer them into a space called paging file. In this way, the computing performance can be improved to some extent. Generally speaking, the larger capacity RAM has, the faster programs run. Creating virtual memory truly is helpful to the computational speed when the RAM runs out, but not as helpful as extending RAM because the reading speed of RAM is much faster than HDD. It seems that there’s no need for us to use virtual memory anymore if we have a RAM that is large enough, not to mention that the reading speed of hard drive is way slower than it of RAM. Then will the running speed be improved if we disable the virtual memory? In fact, the answer is NO. As a matter of fact, many of the core functions of Windows and some third-party software will employ paging files. In this case, third-party software may experience the lack of virtual memory if we choose to disable the latter, especially for the software like PhotoShop. Therefore, no matter how large the capacity of RAM is, it’s still necessary for us to enable the virtual memory. Another thing about virtual memory is that Windows only uses paging files when it’s necessary. In other words, Windows does not use paging files all the time. So even though we disable virtual memory, the performance of our computer still won’t be improved at all. Some people may have a question like this: virtual memory occupies some space on the system drive, and the size of the paging files are changing constantly which may generate disk fragmentation, both of these two factors may cause the deterioration of system performance. How can we deal with this? 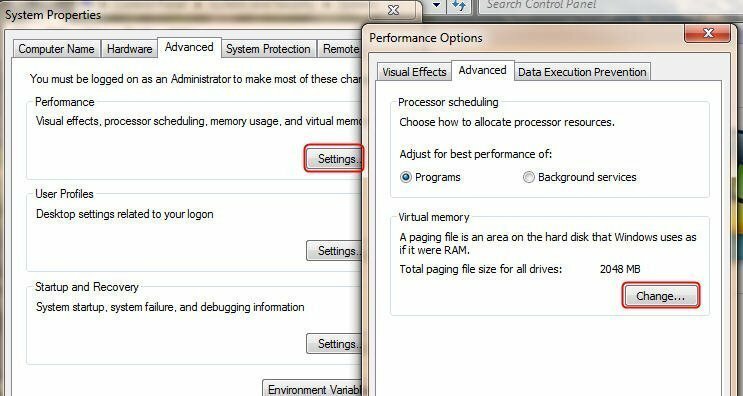 How to Move Virtual Memory? In order to save space for the system partition and avoid the generating of disk fragmentation, we can apply the method below to move the paging files to a large space partition other than the system partition. 3. Click on the Change button like in the picture above. 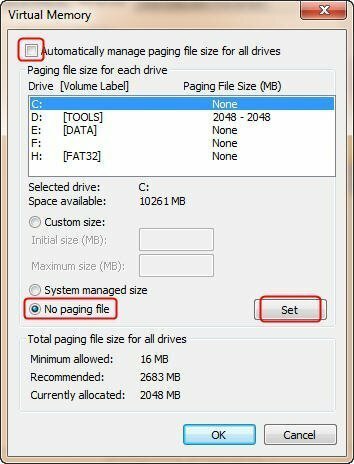 In Virtual Memory interface, Uncheck Automaticaly manage paging file size for all drivers, then choose No paging file and click on Set button like in the below picture. Hence the paging file on the system partition has been deleted completely. 4. Go into Virtual Memory again like in the above picture, click on a partition other than the system partition then choose System managed size, click Set and OK to finalize the process. Restart Windows. Thus the paging files have been moved to another partition.